A recent presentation by Northwestern Professor Therese McGuire to Nebraska state legislators, sponsored by the OpenSky Institute, argued that tax increases do not affect economic growth or employment. We found this result odd, because the vast majority of peer-reviewed studies on the effects of taxes find that taxes do negatively impact economic growth, especially high, progressive income taxes, and corporate income taxes. On empirical and theoretical grounds, the negative effects of tax increases are nigh indisputable: even advocates of higher taxes usually argue, not that taxes don’t matter, but just that spending matters more. Out of all the possible examples, McGuire strangely picks Illinois to make her point. Illinois steeply raised its taxes in 2011 in order to pay mounting pension liabilities. This has led to a slew of calls for special corporate tax breaks, which we have covered extensively. The demand for these incentives is evidence that tax rates matter for businesses, even if the incentives themselves are distortionary and unfair. McGuire says that the jury is still out on the effect of Illinois’ tax increases; but with the tax hikes three years behind us, we can at least begin to look at early results. As I’ve written elsewhere, a good way to consider the effect of a tax change is to find two states that have similar economies, but different tax policies. Both before the tax hikes and today, Illinois and Indiana looked like pretty similar Midwestern states with one or two major urban centers, similar weather and demography, transportation links, levels of education, etc. Before 2011, they also had similar tax policy: Illinois had a flat 7.3 percent corporate tax, Indiana had a flat 8.5 percent rate. Illinois had a flat 3 percent income tax, Indiana had a flat 3.4 percent income tax. Then, from January 2011 to today, the states diverged. Indiana has cut its corporate rates every year, and has begun cutting the personal income tax. Illinois has raised its corporate rates to over 9 percent, and raised the income tax as well. So, the question is, have Indiana and Illinois’ economies shown a similar divergence since 2011? The answer is yes, they have. 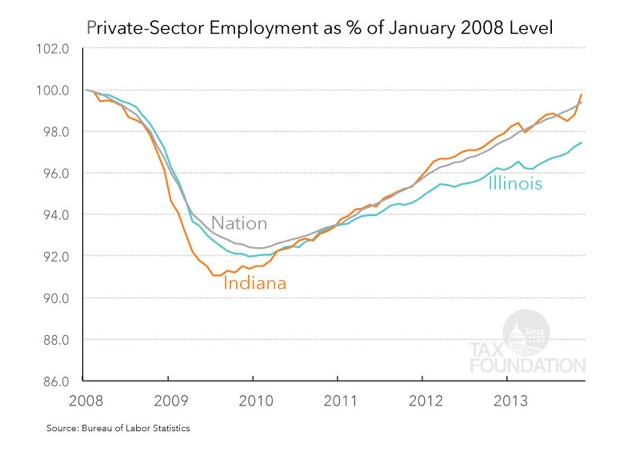 Indiana actually lost a bigger share of its private-sector jobs than Illinois did, experiencing a deeper recession. Until 2010, private sector jobs in Indiana and Illinois grew at about the same rate (actually, Illinois did better in some periods, and had slightly lower taxes at the time). But then in 2011, just when Indiana began cutting taxes and Illinois began raising them, Indiana passed Illinois. Indiana’s job growth has continued to meet or exceed the national average as they continue to cut taxes, while Illinois continues to experience sluggish job growth. Taxes aren’t the whole equation here: economic growth is affected by innumerable variables. But they do matter. The case of Illinois is a great example of how higher taxes can contribute to a worsening business climate, which leads to less jobs. So really, we agree with McGuire on at least one thing: Illinois provides a useful lesson for Nebraska legislators. We just think the lesson is that tax hikes are bad for economic growth. To read the book we wrote on options for tax reform in Nebraska, click here.